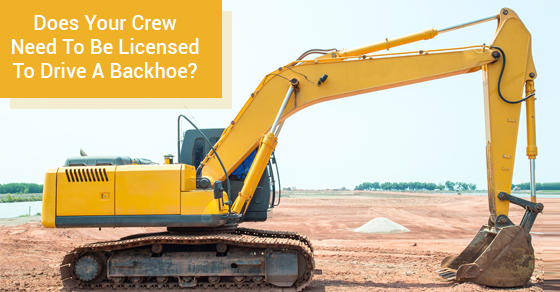 Does Your Construction Crew Need To Be Licensed To Drive A Backhoe? Construction requires the use of large machinery and vehicles that increase the need for safety considerations and skilled expertise. Backhoes are commonly used on a variety of construction sites and crews where power is needed to perform many tasks. Your crew needs to understand how to operate a backhoe and other construction equipment. But does your construction crew need to be licensed to drive a backhoe? Understanding the duties of a backhoe operator and the skills needed provides you with the information you need to ensure a safe and effective worksite. Backhoe operators work alongside large machinery to perform tasks that include trenching and excavating. Backhoes let you move a large amount of dirt and debris as needed to complete your construction project. Many operators acquire the skills to operate a backhoe while on the job or through an apprenticeship program within a construction organization. Backhoes must be used at various sites, so their transport is also required. Backhoe operators must also know how to operate different sized backhoes. Those used for large operations are typically larger and have more power than backhoes used for residential construction projects. There are training programs available for individuals to learn how to operate large pieces of equipment such as backhoes. But there are no licensing requirements that need to be met in order to operate a backhoe. Enrolling in a training program can give you the skills needed for backhoe operation. More importantly, it may add value to an employee or potential employee in the eyes of their current or future employers. Regardless of whether or not your crew has participated in a training program, crewmembers must remain in compliance with the standards set out by the Canada Occupational Health and Safety Regulations in relation to trenching and excavation. Crewmembers should have prior experience in workplaces that require the movement and transport of heavy equipment and materials. These skills allow for the proper use of backhoes and other machinery. There are certification courses that provide individuals with the skills and education needed to operate a wide range of workplace machinery. Courses include information related to safety standards and equipment maintenance among other valuable skills. Applicants are typically expected to have a license to operate a motor vehicle, and some require that students have a high school diploma. The courses cover topics related to the operation of heavy machinery, safety regulations, maintenance, and emergency response. Ultimately, backhoe operators do not need to have a certification. A driver’s license will be required to assist in the transport of backhoes and other large equipment between work sites. In addition, the requirements and standards related to backhoe operation may vary depending on your location. You should research your local requirements to avoid any unwanted issues. Understanding the needs of backhoe operators and ensuring that your crew has the knowledge and skills to work with large equipment creates a safe and productive workplace for everyone.